I just got another toy! 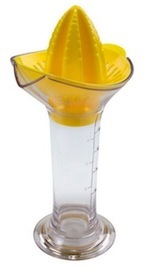 This time, it's the Metro Design JuiceLab Manual-Style Citrus Juicer (that names needs to be a tad longer). While I typically use a Norpro Lime Juicer for my citrus juicing needs, I recently encountered some recipes requiring a measured amount of lemon/lime juice. So, I requested the JuiceLab Juicer for Christmas and Santa came through - woo hoo! P.S. I never ever buy both lemon and lime juicers of any style. I simply get the lemon juicer as it tends to be bigger than the lime juicer, so I can use it for both lemons and limes.